SacMaster® Bulk Bag Discharge Systems are the solution in material handling for a variety of industries. 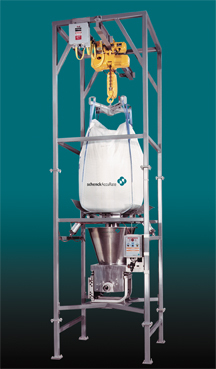 Optimum design provides for capability of integration with volumetric and gravimetric feeders for a complete and accurate system to meter bulk bag supplied material. SacMaster® Bulk Bag Discharge Systems offer bag tensioning, hoist or fork lift loading, height adjustability and patented "Posi-Flow" adaptive bag agitation for superior material movement. Dust containment system available. SacMaster® offers three different modular components to meet the needs of your specific application. Fork-Truck Loading, Bulk Bag Positioning Guide for Overhead Hoist Loading, or Dedicated Hoist Loading. PLC controlled "Posi-Flow" adaptive bag agitation. Hoist or fork lift bag loading. Bag tensioning and bag liner management.